Recreational events have now been around for three years and provide a safe, fun environment where competitors can get their ‘training wheels’ before joining the Amateur Division. Many teachers, and therefore students, are not aware that there is a strict syllabus for Recreational Division. It is a simpler program but defined, so dancers can focus on technique and basics. Many recreational competitors are unknowingly breaking the rules. It is EXACTLY the same restricted syllabus used in the previous Level 1/E Grade Divisions. Also it is the same syllabus used for Amateur Division Juveniles. For the full list of figures go to here. 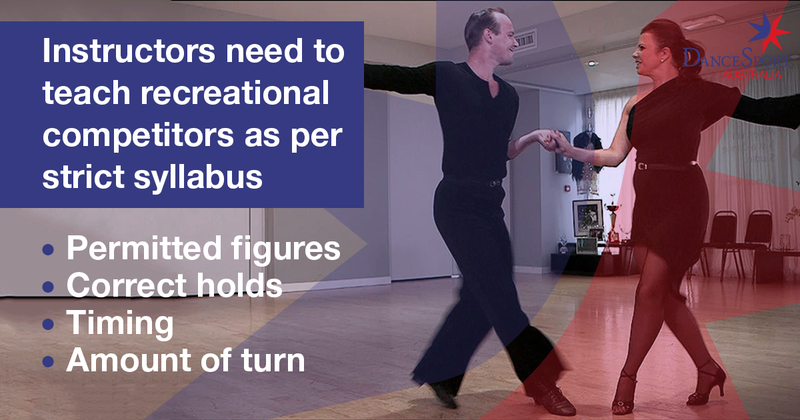 Our Recreational competitors rely on you - their instructors - to inform them of the permitted figures and dancing them in the correct holds, timing and amount of turn as specified in the strict syllabus approved by DSA. As one of Australia's well respected coaches said, "There is no reason why you cannot create an interesting routine given all the figures and variations available".